Kevin knew the value of combining his sound knowledge of growing Radiata pine with knowledge of the growth potential of his farm in Hawke's Bay (site, soils, climate). Kevin likes to keep the stocking of his forest high enough to suppress branching, reduce taper and to maximise tree height growth. He also prefers to plant at around 1,000 stems per hectare so there is plenty of choice to select the best trees at thinning time – the ones whose genetics work particularly well on his site. Kevin also understood that total recoverable (wood) volume was maximised by maintaining a relatively high final crop stocking. The Willows block was established in 1991. It has some significant dry, infertile faces and some swampy areas. This block was planted at only 625 stems per hectare (now considered too low by Kevin – he would now start at 1,000). Silviculture was applied in a timely manner by the family but wind damage and some poorly performing trees lead to a final pruned crop stocking of 300-360 stems per hectare (again lower than Kevin’s ideal targets). The Mistletoe block was established in 1992. It had some steep and swampy areas too. The initial stocking was 1,000 stems per hectare and timely silviculture resulted in a high-pruned stand at about 350 stems per hectare at maturity. PF Olsen managed the harvesting of Kevin’s two forestry blocks in late 2016. Per hectare log yield of 875 tonnes over 8.6 hectares. Not a bad return for relatively small forestry blocks on parts of the farm not that well suited to other land uses! “A lot of credit for such a successful result and stress-free harvesting goes to Chris Perry of the Napier office of PF Olsen Ltd for his excellent management of all aspects of harvesting, including the contracting of a high performing harvesting crew who have done an excellent job in felling, log-making and loading out." 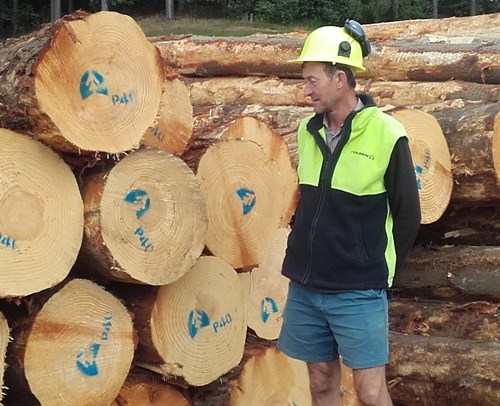 “Chris is supported by a specialised marketing division based in Rotorua who have access to a number of competing overseas buyers for our logs. All the pruned clearwood went to local sawmills."